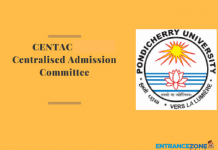 JKCET 2019 Admit Card has been released. JKCET or Jammu & Kashmir Common Entrance Test 2019 is for Admission into Engineering and Architecture courses. The JKCET 2019 (CET – Engineering) is conducted by The Jammu and Kashmir Board of Professional Entrance Examinations i.e., JKBOPEE. Jammu & Kashmir Engineering Entrance Test Date is 28 April 2019. It is a state level entrance exam which is conducted once in a year. Candidates qualifying this exam can get admission in the B. Tech and B. Arch courses in the state situated colleges. Admission into medical programme will be offered on the basis of NEET UG score. For more information on JKCET 2019, candidates should read the complete article. 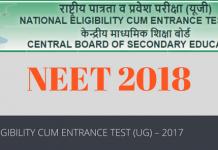 The Common Entrance Test (CET) – 2019 will take place for providing admission to meritorious students. To get admission in the undergraduate Bachelor of Engineering (B.E) courses in the Government run and private institutions of the J&K State, students have to qualify this exam. For all the relevant information regarding JKCET 2019, students should go through this article. And official links are also given at the end of this page. The latest updates are maintained here, keep watching this page for latest genuine information. JKCET 2019 Admit Card has been released on 15 April 2019. JKCET 2019 Notification has been released on 27 January 2019. And Application Form has been available from 01 February and last date is 27 March 2019(Extended). Click here> Application form. Furthermore, the official information brochure and admission notification PDFs are linked at the end of this page. The Jammu & Kashmir Common Entrance Test 2019 details are mentioned here. The Student should be cautious while filling up the online application form. Any error at the initial stage may not get rectified later on and this may prove very costly to a promising student. If any detail is found to be false, his/her candidature will be cancelled immediately. The selections are recommended according to the preference for courses and the Institutions indicated and most importantly, the marks procured by the applicant. The important dates for Jammu & Kashmir Common Entrance Test 2019 are published by BOPEE and JKCET 2019 Important Dates are given below. The JKCET Hall Ticket has been available to download on 15 April 2019 at the JKCET official website. No candidate will be allowed to enter Test Centre/venue without valid Admit Card. Permission to enter the test venue will not be granted to the candidate without the admit card. Aspirants should download the admit card within a specific time frame. A student with the admit card but not meeting the eligibility criteria will have to face rejection. The Admit Cards will be available online. Candidates will receive separate Notification for the release of admit card. They can download via the official website mentioned below. All the candidate wish to sit for JKCET 2019 examination should visit the official website for filling the application form. It must be filled on or before 10 March 2019(Extended). Then, after the form filling process they should also have to make Application fee payment of Rs 800/- via online J&K BANK integrated payment gateway only. They can do so via credit card/debit card or even net banking also. Also, online payments are for the student’s ease and convenient purpose. The applicants are advised to fill the online Application Forms on their own and also being a responsible person and candidate as well. Applicants can also contact the Help Desk of I.T. Section of BOPEE Jammu/Srinagar for any further assistance in this regard on any working day but do so beforehand the last submitting date of confirmation Page only. The steps to apply for Jammu & Kashmir Engineering Entrance Test is given here. Firstly, aspirants have to fill the form via online mode only and also attest photocopies of the Permanent Resident Certificate, Marks Certificate with other certificates. Also be ready with all these documents at the time of the counselling process. Reserved category student should indicate their category in the specific column along with its code. And they also have to attest the photocopy of the same in the form itself. Aspirants should also produce sports quota certificate, if any, to the sports council within a specific date. The candidates have the privilege of modifying their online Application Form before a specific date. Further, after the submission, no student can change or modify the application form. It is in the interest of the candidate to make a double check before submitting the online application form. The registration process for J and K Common Entrance Test 2019 is given here. Applicants should keep an eye on the on the official website for latest updates. And the candidates should paste and attest the photo on the print out of the admit card. of I.T. Section of BOPEE via DD of Rs 100/-. 2)BOPEE Office, 4th Floor, South Block, Bahu Plaza, Jammu-180012 (11 A.M. to 5 P.M.). Candidates should well maintain the admit cards till the of completion of admission process. Admit card is an extremely important document. Aspirants should not mutilate, befoul or change the admit card in any manner which makes it doubtful. The eligibility criteria for J&K Common Entrance Test 2019 is published by BOPEE. The candidates are advanced to check the eligibility criteria before filling the online application form. Residents: Applicants must be permanent domicile of Jammu & Kashmir State. Subjects: And candidates must have passed 12th board from a recognised Board/ University. Also, candidates must have English, Physics, Chemistry and Mathematics as one of the subjects. Minimum Marks: The applicants must have scored minimum 50% marks in the 12th class board, Whereas reserved categories candidates need 40% marks in aggregate. Appearing: Also the appearing candidates for class 12th or any other equivalent exam in 2019 can also apply for JKCET 2019. The pattern of question paper is mentioned here. before answering any question. Whether a Question Booklet has any missing page, blank page, missed the question or damaged or defaced page etc. Kindly contact the invigilator if finds so. The Question Booklet must have 60 questions per subject. One cannot suppose to complain to the Board after the termination of the exam. It contains several pages stapled together in one cover. The details about question paper is described here. The questions are based on the relevant subject that a 10+2 student is expected to know in entrance test meant for admission to get into Engineering Courses. One should not break the seal containing Question Booklet until the permission to do so. The students should write their Roll Number on the cover page of the Question Booklet at the space provided for the purpose. And Each question paper has four series i.e., A, B, C and D on the cover page of the Question Booklet and also at the end of the examination. Candidates can take the Question Booklets with them. CET shall consist of a single paper with three sections comprising of Physics, Chemistry and Mathematics with 180 questions (60 questions from each section). The questions will be multiple choice objective type with one mark each. 1/4 (0.25) marks will be deducted for each wrong answer. The Entrance Test will take place at the centres, notified by the BOPEE in the cities of Srinagar and Jammu only. The BOPEE administration will provide the test centre. And the admit card consists of rest of the details and the information regarding this. The Test Centre once allotted will not be changed. The merit list for each course will be prepared on the basis of the performance of the candidates in the CET 2019 in the descending order for Open Merit Category and for each Reserved Category, separately. It is necessary for a candidate to obtain at least the minimum qualifying marks in the Entrance Test that will be mentioned by JKCET admin. In case of Any seat left vacate, it will be provided to the candidates according to their merit stance of the specific category (Open or reserved). If in any circumstance, Reserved category seat left vacate due to unavailability of the eligible student then it passes on to the open merit category. 1. Higher marks in Mathematics in CET shall consider first. 2. Candidates obtaining higher marks in Physics in CET, if marks in Mathematics are equal. 3. Candidates older in age will consider for the seat if points as per (1) and (2) are equal. The students can make representation, if against any question in the question paper in the prescribed format. But within after 2-3 working days up to 4 pm after the termination of the Entrance Test. The BOPEE shall make the answer key available on its website in the evening on the conclusion of the last meeting of the examination for students to make representation, if any. Subjects expert will cross check any discrepancy or ambiguity thoroughly to declare the result of the representatives so the student needs to be patient. The error-free result will be possible only if the persons involved in the process of OMR sheet evaluation gets a minimum specific time frame. Firstly, the selection will be strictly on the basis of merit of successful candidates. Also, counselling will starts only after the declaration of the merit list of the student. The official website will furnish the JKCET 2019 counselling schedule and also in the leading English newspaper of the state only. The eligible student will not get separate notice and information. The student should be well present with the required documents and have to make payment of Rs. 500/- in the form of a counselling fee. Selected candidate has to provide information regarding their preference or choice of the course and college as well. Moreover, The selection process will be merit-based only. The brief introduction about the examination is tabulated here. Question: What is the marking scheme of the exam? Answer: +1 mark for each correct answer and -0.25 marks for each incorrect answer. Question: Can Non- Resident of Jammu & Kashmir apply for this? Answer: Yes,appearing candidates can apply. However, these candidates have to produce their original mark sheet before or at the time of counselling/selection. Download JKCET 2019 Information Brochure – Click Here. 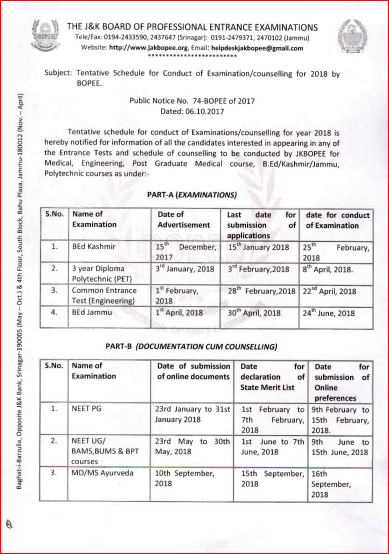 And JKCET 2019 Admission Notification – Click Here. Stay tuned!!! The engineering aspirants should read about JEE MAIN 2019 Updates Here. jkcet online form 2019, jkcet form 2019, jkcet 2019 syllabus, jkcet 2019 exam date, jkcet medical 2019, jkcet colleges, no of seats in jkcet, jkcet 2018 cut off. Arpit passed out from Doon Business School, Dehradun and started writing about examination while doing his internship with entrancezone.